A list of basic knowledge, tips and tricks grouped by beginner, intermediate and advanced. Go to lookout points first to reveal outposts and other points on the map. Use a map guide if you directly want to know where the outposts are (Hirschfelden and Layton Lake). Watch the wind direction, your noise and your visibility to make sure you don't scare animals away. Use the HUD indicators at bottom right. Hide next to trees or in bushes to be less visible. Avoid running unless travelling between locations. You may still spot low scoring animals but trophy animals will be gone before you know. Running on roads makes less noise than running through vegetation. There's a shooting range in the far south east of Hirschfelden, follow the road east starting from the outpost southeast Rathenfeld. It's useful to get a hang of aiming from different ranges. Don't waste in-game money on building hunting structures in the beginning, focus on buying callers, better rifles and an improved scope first. A store is available at each outpost. Change reserve by going to the map in the menu. In the bottom right you have the option to select a reserve. Don't start a new game or you'll lose all progress. Don't be put off if you have a difficult start. 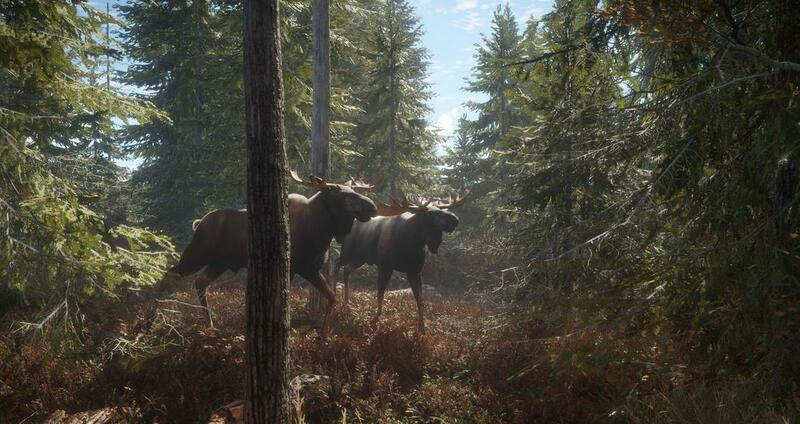 The hunting gets significantly easier when you have all callers and better weapons, scopes, skills, perks, knowledge of the map, ... Focus on exploration (unlocking outposts and other points on the map) and kill easy/small game first to earn money and xp. Don't run towards an animal you've killed if there are other interesting animals are or were close. If well positioned, you'll often be able to call them in again. Animal calls are the best clue you can get, as you know they are close and the general direction. Following random tracks can be both rewarding and frustrating. Fresh tracks don't always mean the animal is still close. You get a skill point or perk point alternately each level you achieve, from level 36 you receive a point every 3 levels. The max level is 60 with 22 perk points and 22 skills points. Spot animals to know their difficulty and estimate their score, you need to unlock the approriate skill for this. Try shooting the highest scoring animal first and take in mind the difficulty when calling an animal. Animal population is the largest around need zones. So look out for them, they are time based. You get xp for discovering one and it will stay marked on the map. They are often located around water and fields. This map guide gives you an indication where you can expect to find each species. Focus on male tracks and calls (blue icon = male, pink icon = female), they give you the best scores. Females are a good for easy money and xp in the beginning though. An ATV is fun and useful for transportation, but useless for hunting itself as it only scares everything away. Repair your ATV by going to your garage and reclaim it. If you scare an animal it will run for about 150-200m and then it will likely go in the same direction it was going before! Early morning (5 AM) is a good time to start your hunt, night hunting is a bigger challenge due to significantly less visibility. Your flash light doesn't affect awareness of animals. If a wounded animal doesn't die within a few minutes minutes, it's not likely to die without another shot. It's recommended to use polymer ammo for rifles as it deals more damage than the soft point ammo. Photo missions are very tricky. You need to be close to the animals and it should be (almost) fully visible. You can crouch faster (making a bit more noise) by using the run keybind. Hunting pressure (purple overlay) is added on the map when an animal has died. So if it's not displayed yet the animal you've shot is still alive! The general wind direction for Layton Lake District is South and for Hirschfelden South West. The wind will turn every now and then, but going north is usually a safe bet. The distance to an animal is important to know for accurate shots, certainly if long range. You don't have a range finder? The position of spotted animals is shown on the map, put a marker on it to know the distance. One of the most useful perks is the zeroing perk. It allows you to choose the zeroing distance of your weapons. For rifles you will be able to choose between 75/150/300m, for bows between 20/40/60m. The distance in the middle is the default zero. When the perk is active don't forget to adjust the distance accordingly before shooting. Instant kills are important for 100% quick kill bonus. For small game (fox, coyote) lung shots may be enough, but bigger game will need spine, neck bone, heart or brain shots. Use the best scope and try to get within 100m for a clean shot. There's no need to put scopes or ammo in your inventory. You can always select a scope and ammo for a weapon from your storage, wherever you are. It will save you some weight you might need to carry another weapon, caller or something else! Keep track of the missed shots number at your hunting profile (codex). It's sometimes the only way to immediately know if you've hit an animal. You can see animals up to about 450m (492 yards) away, may differ depending on your settings and your location (more difference in terrain height compared to the animal increases the distance). Other animals will hardly spook from a shot if they are further than 200m (219 yards) away.